Why not just run all three? I talked to my running homey Antonio and after some discussion about logistics, we realized that based on the timing and location of the races, this would be an insane dash from Chicago to Highland Park to Hoffman Estates to Channahon and back to Chicago, with just enough time to park, get our bibs, run the races and (after carefully stretching, of course) head off to the next one. That's also when we noticed that by a pretty sweet coincidence, the three races just happen to add up to a half marathon. Three races, three cities, 13.1 miles. 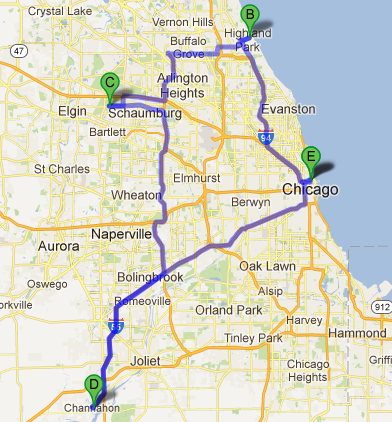 So get ready Highland Park, Hoffman Estates and Channahon. You're about to be part of a new half marathon. This sounds hilarious and awesome! Can't wait to read the recap(s). Good luck! Good luck! I hope you don't trip over me on the trails at the Frozen 5. I'd hate to mess up this adventure! What a great idea! I'm running the 10K in Highland Park... see ya there! Way too good Zach...absolutely grand adventure!! Rock on and write it up.....you're definitely on to something, only question may be what......like a duathalon where you use a car instead of a bike. Ha! I like that idea - the run, drive, run. Maybe we can collaborate with NASCAR on this. This is quite possibly the coolest idea ever--and the best way to spend a Sunday. I'd consider joining you but I'll be skiing, kind of taking on a similar adventure for the 7 Wonders of Vail (ski all 24 of the mountain's lifts from lift open to lift close). Good luck, can't wait to read about how it goes! "the best way to spend a Sunday" - I totally agree. Good luck on your ski adventure. The Cupid's dash has been short the last two years, so you may have extra time to get to the next race! Good luck and fingers crossed for no traffic between races! Usually I'm disappointed by a short race but in this context that is excellent news! Fuzzy from http://fuzzyco.com/ is signed up for this now as well! Three fools either makes it seem not so foolish or even foolisher! Please tell me you are making yourselves medals for this! Well played!